In this episode, the adventurous twosome take on the undersea case of three pirates who swear that the sharks are actually singing! There's trouble in paradise! Join the twin detectives, Mary-Kate & Ashley Olsen ("Full House"), and their sidekick dog, Clue, as they check in for excitement at the Hilton Hawaiian Village Hotel. Travel with the pint-sized supersleuths, Mary-Kate and Ashley Olsen ("Full House"), and their sidekick dog, Clue, to the Edge of the World, where a fleet of UFOs have been flying over Earth every 93 minutes. The pint-sized twins this time are headed to Deald Gulch, USA to explore the mystery of the missing cattle at the Logical I Ranch! It's up to our detective posse to solve this ten-gallon case before high noon. On board the "Fun Ship," the twin detectives find fun and solve crimes while soaking up the Caribbean sun. 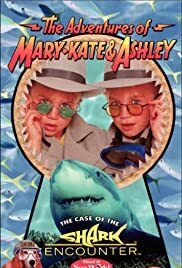 With their motto, "will solve any crime by dinner time," the Trenchcoat Twins, Mary-Kate and Ashley Olsen ("Full House"), are ready to tackle another fun-filled musical adventure mystery. A show about a single father who has his hands full raising twin sisters Mary-Kate and Ashley.